← Can Arsenal Cope if Coquelin Gets Injured? Derby games have an emotional edge above the usual fixtures we watch in the Premier League. There’s a whole lot to play for, and it goes beyond just points. Bragging rights, pride, the spectacle of the event, the whole nine yards. So when a Derby match is soiled by cheating players and shambolic officiating, it leaves a very sour taste in the mouth. Despite all the complains, bitterness, despair and unhappiness displayed by those from the Arsenal camp, it doesn’t change the fact that the Gunners dropped three points but with Manchester City faltering against West Ham, the world has become a better place. “Diego Costa has been charged for an alleged act of violent conduct which was not seen by the match officials but caught on video. “The Chelsea forward was involved in an incident with Arsenal’s Laurent Koscielny in the 43rd minute of the game. He has until 6pm today [September 22] to reply. “Off the ball incidents which are not seen at the time by the match officials are referred to a panel of three former elite referees. “Each referee panel member will review the video footage independently of one another to determine whether they consider it a sending-off offence. For retrospective action to be taken, and an FA charge to follow, the decision by the panel must be unanimous. “Arsenal defender Gabriel has been charged with improper conduct for his behavior following his dismissal, whilst team-mate Santi Cazorla has been warned for his behavior following his sending off. “Finally, both clubs have been charged for failing to control their players under FA Rule E20. I was proud of Gabriel for standing up for his teammate when he was being bullied by that despicable character called Diego Costa. Some would say he was naive and he should have handled the situation better, but it was a heat of the moment stuff and football is about such moments. I’m pretty sure that a fiery character like Jack Wilshere would have done the same thing to defend Kos. Although, I’m saddened with the fact that Gabriel is set to face a suspension when he was getting a decent run out of games following Mertesacker’s recent fitness problems. 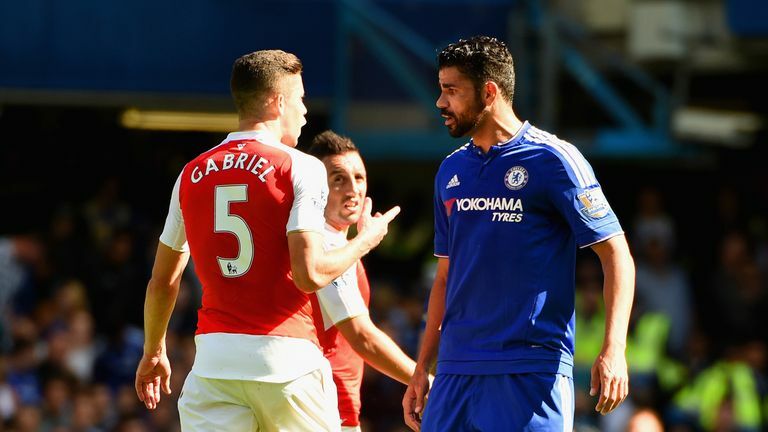 Gabriel will have to learn from this incident and “behave better” in the foreseeable future. On the bright side, the Gunners have enough depth in the side to make for the losses of Gabriel, Santi Cazorla and probably, Francis Coquelin. Posted on September 22, 2015, in Arsenal, Football, Premier League and tagged Arsenal, Football, Gabriel Paulista, Premier League. Bookmark the permalink. Leave a comment.